I finished my final semester two days ago and it still hasn't sunk in. Christmas is just around the corner and I haven't even got a Christmas tree yet! Here is my Christmas wishlist - what's on yours this year? ♥ 2. I have such a thing for wedges! These D&G suede slingback wedge sandals are amazing. I found a tamer version by Schuh which I snapped up quick smart on eBay. They are my graduation present to myself! ♥ 3. Topshop Miu Miu inspired dress. ♥ 4. OPI nail polishes in 'Over the Taupe', 'Parlez-vous OPI?' and 'Dulce de Leche'. ♥ 5. Vintage green and tan satchel via eBay. ♥ 7. Sretsis Double Bow dress in Winsor Purple, given to me as an early Christmas present by my boy. ♥ 8. Topshop red wedge sandals. Gorgeous but oh so hard to come by. ♥ 9. I have a huge soft spot for Tare Panda! I have one of the plush toys and want to get more in different sizes so I can build a huge stack of them in my bedroom. P.S. 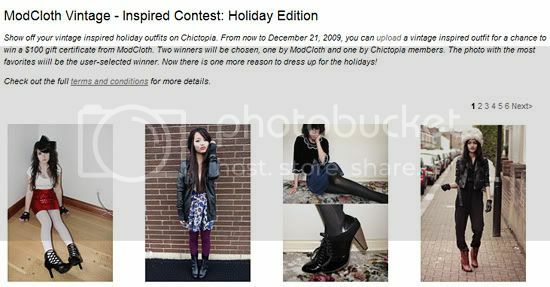 A big thank you to those who have voted for me in the Chictopia/Modcloth contest - I am currently coming third thanks to you all! 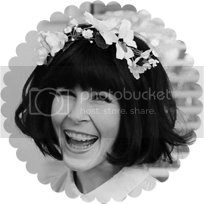 The contest runs until the 21st so please vote for me by adding my entry to your favourite photos. very nice list. i love the topshop dress! i dont want much for christmas, maybe new set of headphones, a couple chunky cardigans, perfume and some fabric. cool items! i love that vintage satchel. :) g'luck with the contest! Great selection of items! I love those red wedge sandals so much-They’re absolutely perfect! those topshop heels remind me of these chloe triple strap pumps (http://images.teamsugar.com/files/users/0/3987/20_2007/index.preview.jpg) i've been in love with these for ages, even meant to have them custom made they are so hard to find online, hopefully they'll be lots of things crossed off your christmas list this year! LOVE the top shop red wedge sandals!!! I was looking at your portfolio too!!! maybe you can ask if they have them in brown? i own "parlez-vous opi?" and it is stunning. The Dolce & Gabbana wedges kill me.. I love them soooooo much!